If you have tried other online casinos before, you will find Spinzwin Casino quite familiar, which is definitely not a bad thing. In fact, it provides comfort to those who have already played at virtual casinos because they know what to do. This online casino offers games for both desktop and mobile players. The choices seem endless with numerous casino slots and more from game studios that you may have heard about before. Creating a new account can be a hassle for some players. It is a good thing that Spinzwin Casino has some ways to lessen the stress for newly registered casino gamers. Once you have signed up for an account, you will be treated with a 100% bonus that can be as much as $/£/€200. 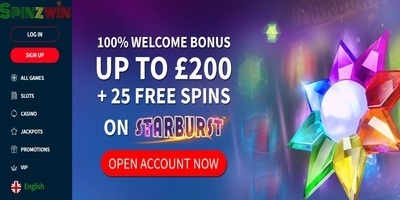 Aside from that, you will be awarded 25 complimentary spins that you can use when you play the Starburst slot game. The wagering requirements are easy to understand. These bonus funds from Spinzwin Casino are subject to the normal requirement, which is 50 times the amount of the welcome bonus. Once you have claimed your new account reward, you can start playing without using your real money. Additionally, you can enjoy other slots and table games. Note though that some games may not add the same amount so you can complete the wagering requirements. Specifically, if you place a bet on slot games, they will contribute 100% of the value of your wager. On the other hand, if you play blackjack or roulette, for example, these games will only contribute 10% of your total bet value. The lowest is video poker, which only counts five per cent. Even if your account is no longer new, Spinzwin Casino does its best to keep its existing players interested. The online casino has a ton of weekly cash back bonuses, along with weekend promotions that you should know about. You also do not want to miss the live casino experience on the website where you can get even more rewards. Furthermore, if you keep reloading your account, you can gain a weekend bonus for being a loyal player. There is also another every Monday and the only requirement that you have to meet is that you should reload your casino account after you have played several hours during Saturdays and Sundays. It is recommended that you give your email details so that Spinzwin Casino can send you regular email promotions straight to your inbox. You can receive instant bonuses by simply reading the message. The best way to get more rewards from the website is to play frequently. Aside from the bonuses and rewards, an important factor that can affect your experience in an online casino is its security. Spinzwin Casino promises to keep your sensitive information safe from hackers and other fraudsters. The website is protected using 128-bit SSL encryption so all your details cannot be accessed illegally. The casino is also fully licenced by the UK Gambling Commission and the Malta Gaming Authority. These two organisations ensure that the casino stays a secure environment for the players while giving everyone a fair chance to win prizes. Spinzwin Casino does not accept PayPal, which is its only downside. However, it does let you use other deposit and withdrawal options, including bank transfers, Euteller, and more. New Players Only. Wagering occurs from real balance first. 50x wagering the bonus or any winnings generated from free spins, contribution may vary per game. The wagering requirement is calculated on bonus bets only. Bonus is valid for 30 Days/ free spins valid for 7 days from issue. Max conversion: 5 times the bonus amount or from free spins: $/£/€ 20 or 200 kr. Full Terms apply..